A Chicago favorite is going mobile. 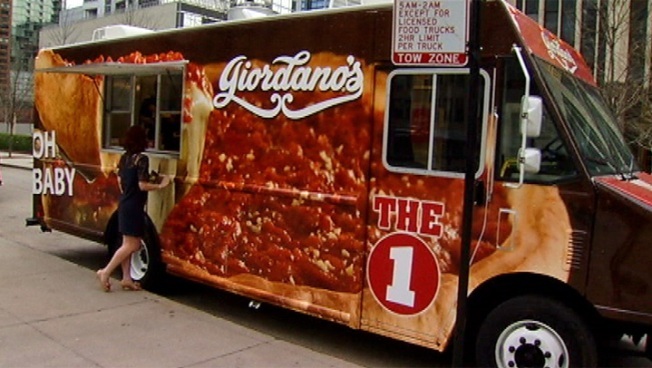 Giordano’s will begin satisfying Chicago’s craving for on-the-go stuffed pizza by hitting the streets Monday with a brand new food truck. The Chicago-based pizzeria created its 41st restaurant by building a custom food truck, designed by Executive Chef Russell Bry. The truck took over a year to create and features a state-of-the-art kitchen and refrigerator to store pre-made pizzas. "With over 40 years in business we have simplified everything and built it for speed," Bry said. "This is all about bringing our famous Giordano's experience to the street, on-the-go, very fast." The food truck's menu keeps things simple, offering three different pizza toppings and salad. The truck will be all over the city this summer, making several appearances at Park District events, and the truck can also be rented for parties or special events. Food Truck Week continues on NBC 5 News Today on Tuesday when Daniella Guzman takes a look at the Salsa Truck.